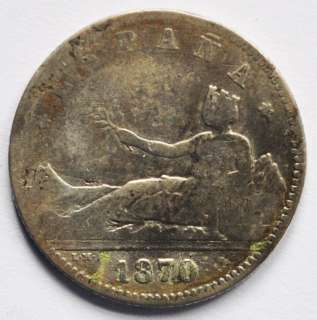 Obverse : Allegory lying down between Pyrenees and Gibraltar, with an olive branch, facing left; ESPAÑA between 6-pointed stars ( 18 incuse in left and 73 in right ); 1870 below. The design is based on coins of the Roman Emperor Hadrian. 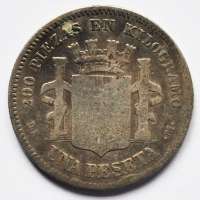 Reverse : Crowned arms between pillars, 200 PIEZAS EN KILOGRAMO, above UNA PESETA below; D·E· below left and ·M· below right.